This weekend, THIS WEEKEND!! OoOoOhhh, it was soooo good! So so very good. It started off with a meet up with our good friends, making the aquaintance of a new friend visiting from Hong-Kong, taking in those beautifully fall colored leaves, and food…food…and more food (come to think about it, I think I strolled rolled around Seoul). Anyways, our good friends recently raved about a burger joint in Seoul that we needed to check out. The reviews were a bit dodgy online, however they were mostly about the staff ignoring them, attitude etc. So what the heck, why not give it a try? We ended up in the area with a hefty appetite after taking in all those beautiful fall leaves. 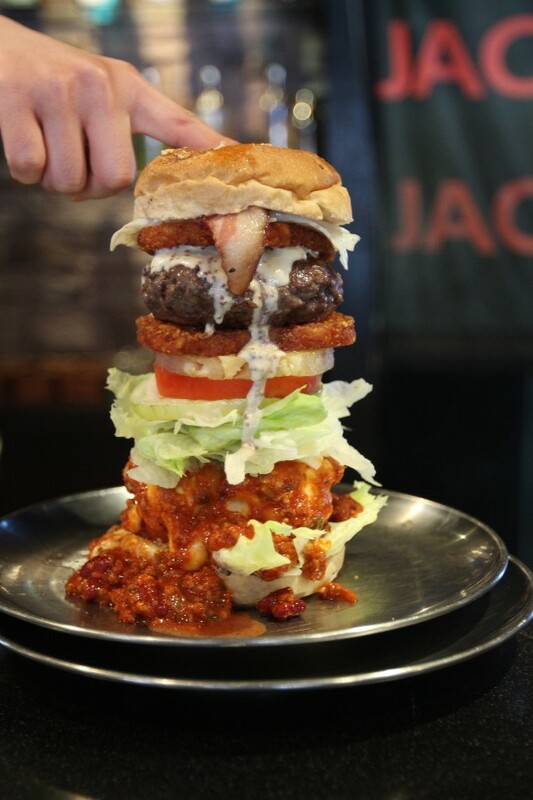 The restaurant is Jacoby’s Burgers located just north of Noksapyung Station in Seoul. Don’t be fooled by the typical restaurant look from the outside, Jacoby’s has quite a unique menu that serves juicy burgers a la carte, pasta, vegetarian burgers, onion rings, freshly cut french fries, salsa and beer. YUM-YUM-YUMMM! Plus they so kindly held the side of attitude when we went, so the overall experience was pretty freggin fantastically delicious. Usually I’m the kind of gal that would order a big ‘ol burger, but my friend Mandy told me that Jacoby’s makes a pretty mean veggie burger made with red-beans. It sparked my interest and I decided to give it a whirl. Now I was left with the harder decisions, to add bacon or not? decisions, decisions…. I know all the vegetarians are cringing out there. Sorry. WOW! The red-bean burger was surprisingly flavorful with a nice little spicy kick. I’d absolutely order it again, but my eye is also on the gut buster burger. Speaking of the gut buster, our table was right up front where we could watch all the burger creations come out of the kitchen. Watching people’s eyes and mouth’s drop open as the gut buster burger landed on their table was priceless! Lordy! Look at that thing! Across the street from Jacoby’s we giggled as we checked out the Camping Company Restaurant. This is urban camping at its finest! We’ve got to go back just go giggle as we grill…totally worth it! Eventually we made our way to Insadong that afternoon and we found out that it just so happened to be Makgeolli (Korean rice wine) day. We cheers the occasion and ordered a roadie, the adios mother. Whew! Quickly found out why it was named that…talk about a nice adult beverage concoction. Another fun-filled adventure in Seoul for the books! DIRECTIONS: Out Noksapyung Station exit #2, walk straight down to the Kimchi pots. At the pots, take the road up to the left. Jacoby’s Burger is just up the road on your left.